But there are “unofficial” witnesses,2 including some of the prominent women of the early Restoration. They also stood by what they saw, heard, and felt through similar disaffections, hardships, and trials. And their names and stories should be remembered. Joseph Smith and Oliver Cowdery began the translation of the Book of Mormon in April 1829, but persecution intensified quickly. Eventually, for safety, and so the work could continue uninterrupted, Joseph, Emma, and Oliver relocated to the home of the Whitmer family in Fayette, NY. Mary was the only known woman to have actually seen the plates. Beyond this, Mother Whitmer’s witness of the golden plates’ reality came before the Three and Eight Witnesses had received theirs.13 This is important. While her testimony is not canonized alongside those of her sons, its sheer existence—the messenger's actual appearance to her with the plates—serves as a critical reminder that the Lord is mindful of the prayers and needs of all His children, male and female. 1. For a discussion of the witnesses and their prophesied role, see Book of Mormon Central, “Who are the "Few" Who were Permitted to See the Plates? (2 Nephi 27:12-13),” KnoWhy 54 (March 15, 2016). 2. 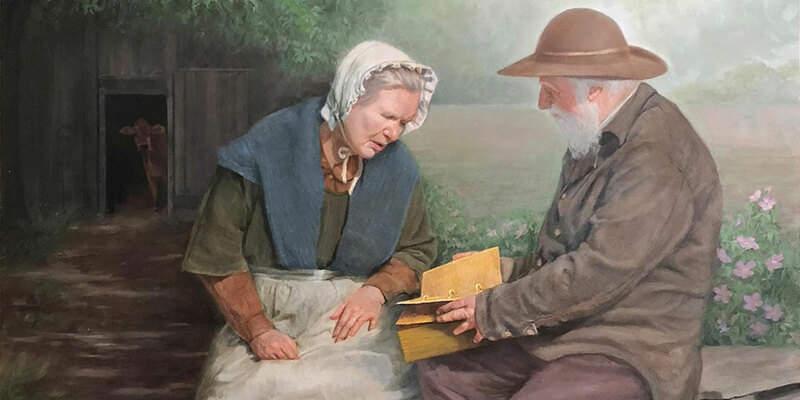 For another fascinating early female witness of the Book of Mormon translation, see Book of Mormon Central, “How Can Sally Conrad’s Witness of the Book of Mormon Strengthen Our Faith? (Alma 37:23),” KnoWhy 385 (November 28, 2017). 3. Richard L. Anderson, Investigating the Book of Mormon Witnesses (Salt Lake City, UT: Deseret Book, 1989), 30. 4. Amy Easton-Flake and Rachel Cope, citing an 1862 agricultural study, remind us that the farmer’s wife “works harder, endures more, than any other place.” See Amy Easton-Flake and Rachel Cope, “A Multiplicity of Witnesses: Women and the Translation Process,” in The Coming Forth of the Book of Mormon: A Marvelous Work and a Wonder, ed. Dennis L. Largey, Andrew H. Hedges, John Hilton III, and Kerry Hull (Salt Lake City and Provo, UT: Deseret Book and Religious Studies Center, Brigham Young University, 2015), 134. 5. Easton-Flake and Cope, “A Multiplicity of Witnesses,” 134. 6. Easton-Flake and Cope, “A Multiplicity of Witnesses,” 134-135. 7. Royal Skousen, “Another Account of Mary Whitmer’s Viewing of the Golden Plates,” Interpreter: A Journal of Mormon Scripture 10 (2014): 39. 8. Skousen, “Another Account,” 39. 9. Janiece L. Johnson and Jennifer Reeder, The Witness of Women: Firsthand Experiences and Testimonies from the Restoration (Salt Lake City, UT: Deseret Book, 2016), 30-31. 10. Johnson and Reeder, The Witness of Women, 30-31. Richard Lloyd Anderson identifies this messenger as the same man who appeared to David Whitmer while he was helping transport Joseph and Oliver to Fayette, NY. Anderson relates the following journal account, “And an aged man about 5 feet 10, heavy set, and on his back an old fashioned army knapsack strapped over his shoulders and something square in it, and he walked alongside of the wagon and wiped the sweat off his face, smiling very pleasantly. David asked him to ride and he replied, ‘I am going across to the Hill Cumorah.’ Soon after they passed, they felt strange and stopped but could see nothing of him-all around was clear. And they asked the Lord about it. He said that the Prophet looked as white as a sheet and said that it was one of the Nephites, and that he had the plates.” See Edward Stevenson, Journal, Dec. 23, 1877 quoted in Richard L. Anderson, Investigating the Book of Mormon Witnesses (Salt Lake City, UT: Deseret Book, 1989), 30. 11. Johnson and Reeder, The Witness of Women, 30-31. 12. Johnson and Reeder, The Witness of Women, 30-31. 13. This follows a pattern that the Lord sets out in the New Testament, when he appeared to Mary Magdalene at the garden tomb before he appeared to his apostles.